After the Fusion Guitar was first assembled there were several issues that needed to be worked on. These issues will be listed here, in order to show areas of potential improvement of this construction. I also hope that my notes here will serve as inspiration and documentation of how each respective issue was addressed. The interior neck extension: Three Carbon rods are epoxied into Mahagoni blocks. The neck angle was difficult to establish due to the flexibility of the body. After first assembling the instrument, the neck angle was much too steep and the resulting action of the strings too high. I assumed that I had made a mistake in my calculations and decided to take the neck out and reconstruct part of it to provide proper string action. Then I noticed that although the action was lowered, it was still much higher than it should have been. 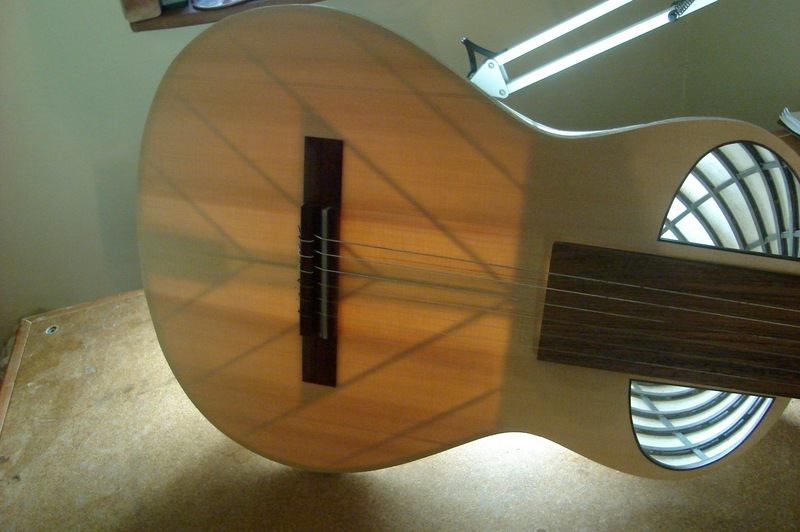 My conclusion is that a part of the instrument is very flexible, making it hard to achieve perfect action without touching the fingerboard (this type of assembly is characteristic of making lutes). The next reasonable modification would be to build an adjustable neck system, so that the neck can be adjusted to the parameters given by the Fusion Body. The light shining through the paper body demonstrates nicely how the bracing can be seen through a guitar top. The wood for this top was of particularly decent quality, allowing to thin it out substantially. The bracing is therefore very easy to see. The sound of this instrument is hard to describe. 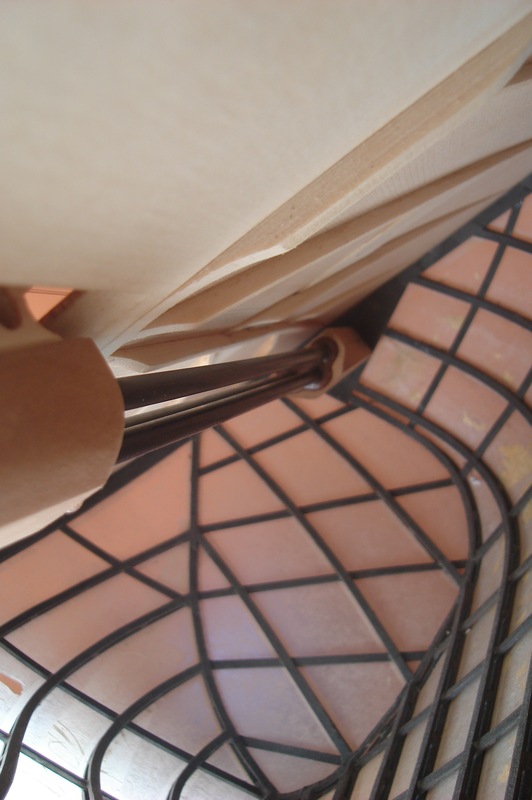 Although it is quite loud and powerful, the sustain and trebles are swallowed by the flexible design – whether it is the paper body or the neck construction is unclear at this point. I suspect that the greatest improvement will be made with the stiffness of the top perimeter. This could be a different body altogether or just a very rigid frame that increases impedance around the perimeter of the top, and also keeps this perimeter from vibrating too easily. The change in weight due to the new neck construction must be assessed (new neck, entire instrument=1071 g). The new neck has increased stability. If this comes with unchanged or lesser instrument weight, a step into the right direction has been made. The action must become easily adjustable to the precise desired height. The sound of the instrument must be improved by either a rigid top frame or a new (much stiffer) body construction. Potentially the neck would need revising as well, depending on the impact of top frame and body. Frets (tied or fixed) will also be necessary to judge the sound properly. The paper body must get revised in terms of durability and aesthetics. Japanese paper turned out to be considerably stronger than the currently used silkspan, and incidentally the use of silkspan and dope was not only very toxic, but the chemicals turned yellow as well. I suspect the use of Japanese paper and maybe a (bleached) rice-based glue could improve a healthier building process and both stability and looks. Although one may be impressed by its beauty and transparency, the body could need some major work to improve the sound; especially sustain, the attack and the higher frequencies.